"If she had known what she was choosing, would she have chosen differently? I owed my life to her, but I didn't feel happy. All I felt was brokenness. The fear of dirt and nothingness and being alone. The loss of my mom and Macon and, in a way, Lena. And something else. The crippling sadness and incredible guilt of being the one who lived." Warning: This review may contain spoilers concerning Beautiful Creatures. Ethan Wate used to think that life in Gatlin was boring and ever-so ordinary, that is, until he met and fell in love with Lena Duchannes. Ever since then, Gatlin has become a place of mystery, a place of incomprehensible magic. And death. A dark curse looms over Lena and her family, one that can alter the course of history for man and magickind for forever. One that has already taken a deep toll on the powerful caster girl. After suffering a devastating loss, Lena pulls away from everyone, particularly Ethan. Instead, she finds solice in the dark magic that once terrified her so. With the aid of an unlikely band of misfits, Ethan sets out on a journey not only to save the girl he loves, but to uncover the hidden secrets that have bound him and his family to Gatlin for decades. Ethan was lucky to defeat death once before, but will luck be enough to save his hide (and Lena's) for a second time? So I've pondered Beautiful Darkness for over a week and I'm still not sure how I feel about this book.Part of me really enjoyed it and part of me, well, part of me was less than impressed. If you remember, my feelings on Beautiful Creatures were also all over the place, though that had more to do with my comparing it to the movie version (bad habits die hard!). But despite any reservations that I may have had with the first book, there's definitely a good foundation for the story so I decided to continue on with the series. Andeven after reading this book, all hesitation aside, I probably will pick up Book #3. 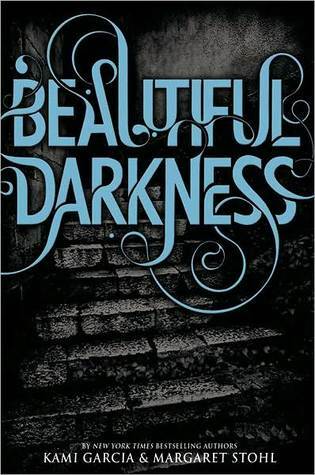 Beautiful Darkness is exactly what the title suggests --- it's dark (much darker than its predecessor) and in it, both Ethan and Lena explore the sinister sides of Gatlin. And, consequently, themselves. The story takes place during the immediate aftermath of Lena's 16th birthday as she struggles to deal with the loss of Macon. Basically, she feels like Macon's death is her fault and her belief that she's doomed for darkness leads to a surprisingly gothic transformation. I really enjoyed seeing Lena-gone-bad, although, at times it got a little too emo. And of course, there's the inevitable romantic tension between Ethan and Lena. Unfortunately, this causes the beginning to drag as Ethan's constant brooding takes over. Enter Liv (a keeper in-training) and John Breed (the mysterious loner dude) to amp up the ambiguity in their already strained relationship. The story didn't really pick up until about 100 pages in with the appearance of an old fan favourite, Ridley. And let me just say, the mischief that her and Lena get into is well worth the wait. Ridley has quickly become one of my favourite characters. Honestly, where I loved Ethan in the first book, the side characters (Link, RIdley and Liv) really stole the show here. Each of them becomes central to the story, serving an integral purpose. Their choices all have life (or death) altering consequences. Garcia and Stohl flip the script on what we think we know and we quickly learn that people are more than what they initially seem. Especially Ethan.There's a reason he's so deeply bonded with Lena and he learns just how much his destiny is irrevocably intertwined in the caster world. Again, the pacing starts lacking until Ethan, Liv and Link team up on a hero's quest to save Lena from the clutches of evil. During their journey, there are many anticipated and unanticipated helpers along the way. However, the problem I had with this was in the too-convenient timing and in the identities of some of their saviors. I dunno, it felt too easy. I never really felt scared for the characters in the way I should have been, rendering the shock-value ineffective. Justice is never really served so there's no sense of loss or vindication. There was an emotional disconnect for me as a reader. And like the ending in Book #1, we're left with yet another non-ending. You can tell how Garcia and Stohl are setting the story up for future installments.Needless to say, it was somewhat frustrating. Beautiful Darkness is a book full of deceit, jealousy, love, loss, confusion and sacrifice. It's one of those stories that reveals many new truths that were previously unknown to key figures in the story. We're driven deeper into the underbelly of the caster world and shown a darker sort of magic. Just about every character experiences some sort of transformation. "Lena and I would never be the same. Link and Ridley were so supernaturally altered, they weren't even in the same universe.."
Can I just go on a side rant for a second regarding Link's big change --- umm, why? Can anyone tell me? Because it comes up out of nowhere and then they act like it's all a big joke. What was the point of that? By the end of the journey, many revelations are made, albeit some were more effective than others. Where there were things I liked (like their quest), there were plenty of things that offset the good. While the story wasn't predictable, it didn't leave me on the edge of my seat. I found it to be amusing in some places and contrived in others. I had kind of hoped that writing all of my thoughts out would help me to sort my feelings more definitively, but it hasn't so I'll leave you with this: I liked the book enough to want to finish the series, but I thought the first one was marginally better (again, probably due to its wayward charm). 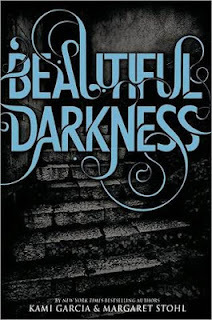 Beautiful Darkness is an amusing follow-up to Book #1 in the Caster Chronicles. While the pacing is uneven, the story is magically intense. Featuring some unbelievable appearances from an unlikely band of misfits, it's a dark journey into the bowels of the caster world and not everything is as it appears to be. The book, like Ethan and Lena, has its ups and downs but if you're like me, and you dig the foundation, it's definitely worth a read. Hmmm...I keep seeing this series all over the place. I'd love to sit down and read the whole thing. If you want to finish the series, then that's a good thing. The foundation of the story is really great, especially if you like the paranormal genre. It's not perfect by any means, but worth giving a try for sure.